Plymouth Argyle have signed Colchester United captain Karl Duguid on a two-year deal for an undisclosed fee. The 30-year-old midfielder, who had played nearly 450 games for the Essex club in 14 seasons, is manager Paul Sturrock's second signing this summer. "I am very pleased to have Karl on board, he's a versatile player," Sturrock told the club's website. "He's a player who I have seen play many times against my teams and he has always impressed me." Duguid, who can also play in defence, joined the U's as a youth team player and was voted as the club's greatest ever player by Colchester fans. He has been captain of the side for the past four seasons and has played over 80 matches in the Championship. With Argyle losing a host of experienced players over the summer, such as Paul Wotton, Lilian Nalis and Lee Hodges, Duguid hopes his experience will help fill the void. "I know there are a lot of young players here, Jason Puncheon signed last week and he's only 22, so it's nice for them to have older players around them to help them on." 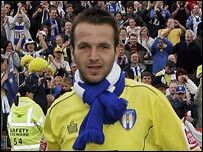 "It's been a great 14 years at Colchester, I was there half my life, but I think it's time to move on."